We are closed: January 1st, Memorial Day, Fourth of July, Labor Day, Thanksgiving Day, and Christmas Day. We are open: MLK Jr. Day, President's Day, Columbus Day, Veteran's Day, and Thanksgiving Friday. We close at noon on: New Year's Eve, the day before Thanksgiving, and Christmas Eve. We are closed in the evening for Andover Town Meeting. On April 30th starting at 5pm we will have an Art Opening at the Bachelder Library. The featured artists will be students from the East Andover Village Preschool. Most of the artists will be attending the opening and will be explaining their artwork. If you are not able to attend the opening, feel free to check out their artwork anytime during the month of May. The show will close on May 31st. We’ll be showing films 4 - 6 from the Harry Potter Series during school vacation week. On Tuesday April 23rd we will show Harry Potter and the Goblet of Fire, on Thursday, April 25th we will show Harry Potter and the Order of the Phoenix, and on Friday, April 26th we will show Harry Potter and the Half-Blood Prince. All films will start at 6:00 pm at the Bachelder Library. Feel free to bring pillows, chairs, cushions, and magic wands. Popcorn will be served. Please, no unaccompanied children under 13. Weather permitting, we’ll meet at 9:30 am on Mondays and Wednesdays at the Bachelder Library (12 Chase Hill Road in East Andover). We’ll head up Chase Hill Road, turn on to Emory Road and eventually head back to the library for some tea and some good books. Please contact Lee Wells (wablibrary@comcast.net) if you would like to join us or if you have any questions. The adult book club meets at Bachelder the last Wednesday of the month at 7pm. Books can be picked up at both libraries. For more information on programs and events for kids click here. 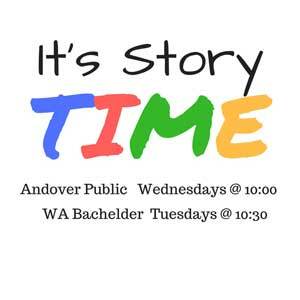 Watch for articles and new book lists in the Andover Beacon every month! Visit our Town's monthly newspaper by clicking on the Andover Beacon button above.